The joys of hot sauce are many. Whether it’s slathering it all over a slice of some nice Brooklyn pizza or droppin’ spoonfuls to brighten up a homemade salsa or marinade, you can always count on being satisfied every time you open the fridge and see a nice full bottle, ready to titillate your taste buds. Your adventurous food column contributor ChezJJP has been experimenting with two recipes for a couple years. The first is tomatillo and poblano pepper based, and is fresh, tangy and mild with a beautiful green color. The other is hotter and combines the flavors and color of small red peppers, baby tomatoes and habaneros to give a bright red fiery concoction that can lead to dizziness and profuse sweating as well as total atomic combustion of the palate. How wonderful. So you might ask “but JJP, that sounds like so much fun! How do I make my own?” Yes, how do you make your own? Hot sauce can be made a million ways, and what I describe here is just my personal take on it. There’s nothing like turning a couple lonely veggies from the CSA into a total barn-burner. So what ingredients should be involved? Well, from my observations, it seems to be clear that hot sauces are built with four parts: a) chile peppers for the heat and sharp flavor b) a base ingredient for the sauce’s body (main flavor) and color c) vinegar for the tang and preservation and d) other random components such as onion and garlic which give the sauce a personality. The chile pepper component can range from a sweet pepper like the Cherry pepper to an insanely hot pepper like the Habanero. It is up to you to knock your socks off to desired intensity. Do some online research about the different peppers because you need to know what level of danger you are dealing with. Chiles can hurt you bad. You should know that the seeds contain the most “hotness”. (The scientific name for the “hotness” chemical is “capsaicin”). So, do not add the seeds if you think the sauce will be too hot. 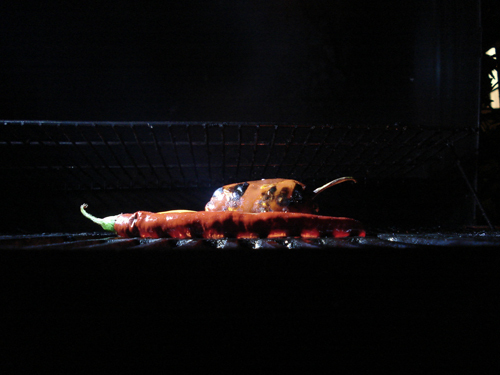 Also, see Tip #1 from below before you attempt anything with chile peppers. The base component is most commonly tomatoes, sweet red peppers or tomatillos (which, like the tomato, is a fruit) and its presence assures that you can actually feel full flavor on each side of your tongue, as opposed to pure heat on whichever spot that type of chile pepper hits. You can also use carrots for some sweetness. There are infinite variations. Vinegar is just an essential component of hot sauce, because vinegar is good, and vinegar is addictive. Hot sauce needs vinegar. Vinegar needs hot sauce. Period. Random components give the hot sauce an identity or a direction. You might want to create a concept around something called Garlic Love Fest 2008, in which case you could add a ton of garlic cloves to the mix. You might want to flavor the hot sauce with an herb, such as cilantro for added flavor. You might want it to be sweet, by adding pureed apples or papaya. You could add tequila, or just the worm. I think I have made the point by now, that the point of cooking is to create something that is your own by going with your gut and realizing your ideas. Assemble the desired ingredients in front of you. Try and figure out the right proportions. Chop and optionally de-seed your chiles. Handle with gloves if using hot ones. For the body of the sauce, if using tomatoes, peel them by hand or by dropping in boiling water for 20 seconds after making an X-mark with a knife. If using big sweet peppers, make sure they are peeled by roasting over open flame until the skin is charred, cooled down and then scraping with a fork. Roughly dice any other element you wish to add. Combine the ingredients in a food processor or blender with a small amount of vinegar. Blend and transfer to small saucepan. Simmer for 20 minutes to let the flavors combine. Season with salt and pepper. Leave in refrigerator for several hours to chill. Transfer to small glass bottle or squeeze bottle. 1. Use Gloves!!!! Buy plastic throwaway gloves when you handle chiles. Do not question this and do not skip this step. “Capsaicin” (the chemical that is responsible for the heat) gets on your hands and in your eyes and god forbid you visit the washroom without having used gloves (especially if you are a dude). 2. Roast the peppers on the grill if you can. There is nothing like that smoky flavor from charcoal. Plus, as I said, it makes your hot sauce more special when you are sitting around your living room, slathering it on cold pizza or pad thai while it’s raining outside. 3. Buy plastic squeeze bottles and use them! If chefs use these squeeze bottles to be fancy, why can’t you? 4. Use small amounts of garlic and onion. These are flavor builders, so don’t overpower your sauce. Its all about subtlety. 5. Feel free to use canned chile peppers from the supermarket. Those cans of chipotle peppers in adobo sauce are awesome.